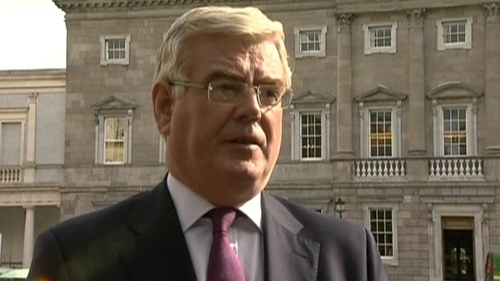 Labour leader Eamon Gilmore has said that winning the next election and a Labour-led Government are achievable objectives. Speaking on RTÉ News at One, a day after a poll showed increased support for Labour, Mr Gilmore said the party would now consider running more than the 65 election candidates already announced and, in particular, three candidates in the Dublin South Central constituency. On economic policy, he said there should be no deeper cuts in the next Budget than the €3bn already announced, because Government policy needed to be consistent in its approach to the financial crisis. He said he accepted the need for the cuts to get the public finances in order. The Millward Brown Lansdowne poll for TV3 News showed that Labour is the most popular party with 35% support, while Mr Gilmore is the choice of 36% of voters as the next Taoiseach. Fine Gael is in second place, with 30% support, while just 19% opted for Enda Kenny as Taoiseach. Fianna Fáil is well beaten in third place on 22%, Sinn Féin on 4% and the Green Party at 4%. Independents and others are on 8%. Millward Brown Lansdowne found the public are evenly divided on the need for an immediate General Election. Of those polled, 49% want to vote now, 47% are opposed and 4% do not know. Tasoieach Brian Cowen said opinion polls were just a snapshot of opinion at any time, but the mandate his Government derived was from sufficient support in the Dáil. Mr Cowen said there has been a fall in support for the Government since the economic crisis began, but the policies they were pursuing were the ones that were necessary to maintain future prospects for the country. Meanwhile, Finance Minister Brian Lenihan has insisted the Taoiseach has his full confidence in the wake of the poll. Mr Lenihan was identified as the public's choice as successor to Mr Cowen in the Millward Brown Lansdowne poll, but he said today he had made it very clear last week that there is no vacancy. Asked about the impact of the controversy over Mr Cowen's Morning Ireland interview, Mr Lenihan said it was difficult to speculate about the causes of a particular poll. He said this was part of a sequence of very difficult polls, as the Government took difficult decisions. Government Chief Whip John Curran has described Fianna Fáil's poor showing in the poll as disappointing, but insisted the figures would not be replicated in a General Election. The poll for TV3 showed that support for Mr Cowen was at 11%. Speaking on Morning Ireland, Mr Curran said all European governments who were taking difficult decisions were unpopular in the polls. Fine Gael's Deputy leader James Reilly has said that the 'big news' out of yesterday's opinion poll is that we have a 'dysfunctional government, which has destroyed this country'. Dr Reilly said that the results were not surprising given the party's 'tough summer', but he said that Fine Gael had put the leadership battle behind it and that the only poll that mattered was the General Election. He said that the party had to get its message out into the public domain and that it hadn't been able to do this because of its 'internal difficulties' over the summer. Asked about Mr Kenny's poll performance, he said that all of the party leaders, bar Mr Gilmore, had lost ground but he urged voters to 'give the man the job, give the party the chance' and said the public had to make a choice between choosing an 'icon' to lead the country or choosing a team'.